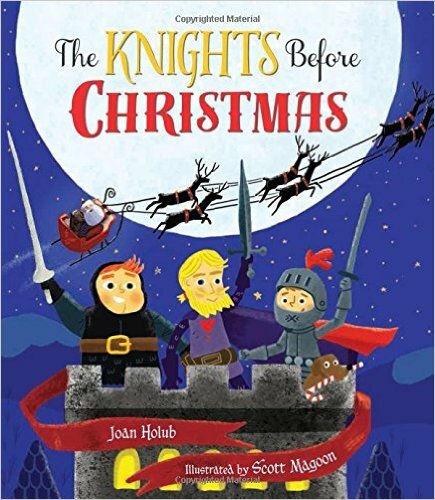 The Knights Before Christmas is not your usual Christmas story but brings with it silly humour and a new kind of Christmas fun. ‘Twas December 24th, and three brave knights were just settling in for the night when out on the drawbridge, there arose such a clatter! The knights try everything to get rid of this unknown invader (Santa Claus! ), a red and white knight with a fleet of dragons. Silly, fun, rhyming humour is what you can find with this trio of Knights as they protect their King from a jolly invader with his fierce dragons (think red suit and his sleigh!). The rhyming follows the much-loved, Twas the Night Before Christmas, which helped as my children could almost guess the next words. We have so much fun whipping this story out, snuggling on the couch and reading it to each other. We have read it almost every night for the last week and it still hasn’t grown old! It definitely puts a new spin on an old family favourite, while adding in humour, excellent illustrations and a theme most young boys and girls can relate to! A fantastic addition to our Christmas book collection. Joan Holub is the author and illustrator of more that 130 children’s books, including Zero the Hero, Little Red Writing, and the Goddess Girls series. She lives in Raleigh, North Carolina. Scott Magoon is the illustrator of many books for young readers, including Spoon and Chopsticks by Amy Krouse Rosenthal, and the author and illustrator of The Boy Who Cried Bigfoot and Breathe. The art director at Houghton Mifflin Books for Children, he lives in the Boston area with his wife and two sons. Disclosure: I received a copy of The Knights Before Christmas in order to facilitate this review. All opinions expressed are my own. This entry was posted in book review, childrens books, Christmas, Raincoast books, review, reviews.